If the furnace has a pilot light, check it to make sure it is lit and blue. A yellow flame means there’s something wrong. Try and turn on the furnace before it gets really cold to make sure it is delivering warm air through the vents. There should be no strange noises or smells. While the furnace is on, also check the ductwork if possible. The one thing that many homeowners forget to put on their fall home maintenance checklist is to change the air filters. Filters need to be changed at least twice a year, and fall is a good time to do it. A dirty filter only spreads dust, allergens, and dirt through the home along with the hot air. The heat exchanger should also be vacuumed out with the vacuum cleaner’s brush attachment and a cloth. Though a newer furnace doesn’t need its oil ports lubricated, an older furnace needs fresh oil at least once a year. 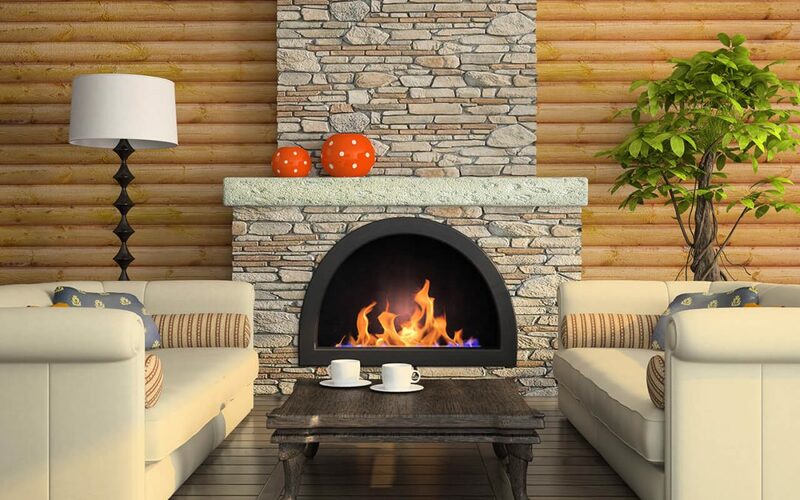 If the home has a fireplace, fall is the time to have it inspected by a home inspector. Make sure that the chimney is free of birds nests and creosote buildup before starting up a fire. By getting this done early in the season, you can arrange for a chimney cleaning or any needed repairs before winter. Another item on the fall home maintenance checklist is the fire extinguisher. Fire extinguishers should be kept away from heat sources but kept in a place where they’re readily accessible. They should be checked every month to see if they’re pressurized. If they’re not, take them to your local fire department for recharging. Never try to recharge an old fire extinguisher yourself; if the fire department won’t do the job, the extinguisher will have to be replaced. Get into the routine of putting new batteries in the smoke and carbon monoxide alarms during fall if they’re not hooked up to the house’s electrical system. Check the plumbing pipes under the faucets for leaks and repair them or have them repaired if any leaks are found. Another item on the fall home maintenance checklist is to replace the lightweight curtains and bedding in the rooms with heavier drapes and blankets. Wash warm-season items and store them in an airtight container. Scrub down the walls and floors of the porch and the patios. Clean the driveway, walkways, deck, and outdoor furniture. Clean out the gutters, and take a look at the roof to check the condition of the shingles. If you aren’t comfortable climbing a ladder to reach your roof, you can hire a handyman to clean your gutters and a home inspector to inspect the roof. Cowan Inspections Group serves Northern Utah, including the Salt Lake City area, with home inspection services. Contact us to schedule an appointment.